It’s springtime and bees, flowers, and love are in the air! When Mr. Squirrel’s friend, the hedgehog, catches sight of an attractive lady hedgehog, he isn’t sure what to do to win her heart. What a stroke of luck that he has a friend like Mr. Squirrel, who can help him. Mr. Squirrel knows all about love, and what ladies like. Lady hedgehogs like heroes! 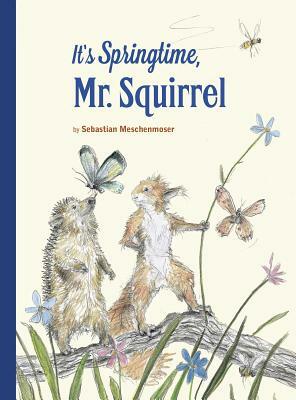 But can Mr. Squirrel and the hedgehog conquer the most dangerous animal in the forest? Sebastian Meschenmoser was born in Frankfurt, Germany, in 1980. He studied fine arts in Mainz, Germany. His illustrations were chosen from more than 2,700 entries and presented at the Children’s Book Fair in Bologna in recognition of him being one of the most innovative new illustrators. As an accomplished artist with several exhibitions to his name, Sebastian Meschenmoser is among Germany’s most successful and admired young illustrators for children. There is almost a kinetic energy to Meschenmoser’s loose-lined, sketchy style, which works to great effect here in a story about the power of spring, and love sweet love, to wake one from a stupor.